If what I understood “holy” to mean isn’t true, then what does it mean? In this message I’d like to continue with what “holy” is by providing eight characteristics to identify someone who is “holy”. Just having one of these characteristics will qualify you. The goals is to ask yourself, could this characteristic reside in me? Who else does it reside in? Characteristic 1: Weird – doing things or acting in ways or having behaviors that don’t normally make sense to others and many times don’t make sense to you. This characteristic was first given to me by Craig Groeschel who wrote a book called (you guessed it), Weird. If others think you’re strange and you don’t follow cultural norms, then you’re “weird”. Characteristic 2: New Normal – doing strange things or uncommon things so long that they become normal to you – new normal, but abnormal to others. This phrase was taken from a message by Steve Blair. If you find yourself creating new methods and ways of doing things that’s outside of the norm, you’re starting new norms. You’re like George Washington Carver finding new ways to do and use things that are commonly used in common ways. Characteristic 3: Uncommon – making a stand to be different from the rest of the pack, becoming a stand-out using principles that common people don’t use. This characteristic can be explored in more detail from Tony Dungy’s book Uncommon. If you’re finding yourself on the outside of the pack, don’t let that bother you, embrace it. You’re meant to be unique, you’re meant to be “uncommon”. Characteristic 4: Like No One Else – doing what others won’t do today so that you can have results that no one else has tomorrow. This is Dave Ramsey’s famous quote “live like no one else, so later you get to live like no one else.” If you live like everyone else, you don’t have to worry about the outcome, you already know what life is like. However, if you want a life that no one else has, but everyone says they want, then you need to live “like no one else”. Characteristic 5: New Creation – making it your habit to better yourself by removing some old attribute and replacing it with a new attribute, regularly. Become the new creation that God wants you to be. Out with the old you and in with the new you. “This means that anyone who belongs to Christ has become a new person. The old life is gone; a new life has begun!” – bible.com/116/2co.5.17.nlt If you have started the transformation process into becoming a better you, those around you won’t understand why you’re changing. They might even say…why are you acting this way? Let them know (you can say I said it), you’re becoming a “new creation”; you got rid of the old you. Characteristic 6: Set Apart [Greek word “hagios”] – different from the rest, special, having the qualities as directed by God, the opposite of common, precious and priceless, God’s masterpiece, unique, one of a kind, like no other, authentic, no longer common, can’t be duplicated or copied, not ordinary, ahead of the pack, standout, made special, foolish to the world, and wise to God. Isn’t that a lot to swallow. To be “set apart”, doesn’t mean you’re perfect, but it does mean there is no other copy of you and no backup. You’re it! You’re the best [whatever you are] there is! Characteristic 7: A Cut Above or 1st Class – not 2nd class or lower, at the top of the game, made from the best, not of inferior quality. This phrase was taken from Joel Osteen who uses it quite often. If you’re being your best everyday, you’re “a cut above”. Others will ask you why you’re doing such a great job and you don’t really know why. Others envy how you do what you do because you’re “a cut above”. That makes you “holy”. Characteristic 8: Anomaly – to deviate from what’s normal, an exception (exceptional). What’s interesting about this word is, it was used in The Matrix, a movie I’ve seen hundreds of times. Neo, The One, was called an “anomaly”. I can write a book just on that thought. For some reason, he would not settle for having the same outcome of what was normally defined. He became a problem for those who wanted him to conform to being “normal”. If you desire to be a problem for what’s normal (hate crimes, bad attitudes, poor work habits, etc. ), then you too are an anomaly. 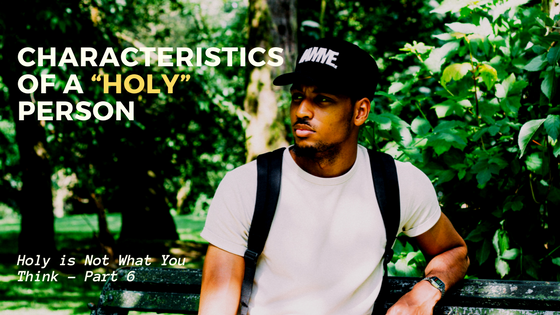 Before I leave you with these characteristics, keep in mind that they all come alive when you encounter God to any degree and you may or may not know that you’ve encountered Him (like Moses standing before a burning bush). He had no idea that what was happening was a God-encounter until He pursued a little closer. He could have turned and ran from the bush, but rather He like others of us have turned towards what makes us uncommon, no-longer-common, “holy”. Holy is not what you think! I invite you to leave us a comment below.